While many of you are struggling with snow (I hope you are OK over there), here in Accra it is still 32-33 degrees C. The harmattan with its dry dusty wind is ending, and humidity is creeping up steadily. Electricity is still an issue: we had a 59% price hike in the cost of electricity in December, which actually became a 69% increase as they added on 10% extra for infrastructure improvements, like street lights (those are not yet observed much in our area). So turning the oven on is actually quite expensive, the metre drops 15 cedis or so (about 4 USD) even if the oven is not on long. Still, it is worth it for my husband’s Friday night pizza! We have a short holiday coming coming up, and need to pre-load the electricity credit so the fridge stays on while we are away. We had better go top up the meter card again; at least we can afford it. The increased costs are tough for many here, and the unions were out demonstrating last week about the increased utility prices (also gas and fun have gone up), so prices are going up noticeably for food, transport and such. Mix, leave for an hour, then add salt. Leave dough to rise 6-7 hours at room temperature (Accra 32C, leave it longer if your kitchen is cold). You can also leave it overnight in the fridge, 24 hours there is recommended. It will rise and become wonderfully gloopy and elastic. It needs to be handled carefully, to keep the air bubbles in the dough. No rolling pins here. My husband uses oiled baking parchment, pre-heats the oven tray and slides the dough over using the parchment. The dough is just poured out, then eased out using fingers to stretch into a rectangle. You want to keep the air bubbles, so gentle is the way to go. I boiled the sweet potato slices first, as they were very hard. In the interim, a few tomatoes were chopped and scattered over dough for moisture. When you have the dough stretched out: top with sweet potato slices and grated cheese. We have sad plastic cheese here, and it is so expensive! 20-28 cedis for 200 grammes of tasteless “cheddar” (4-5 USD). We tried the plastic mozzarella found at Shoprite, which is cheese, of sorts, and OK for pizza. (Yes, over-privileged foreigner right here….) Then bake at 250C until done (8-12 minutes? Depends on your oven) and enjoy! It was actually quite nice, especially with fresh chives sprinkled on top. The cheese situation may have room for improvement, but we figure we might as well explore what’s available locally, and enjoy some of that while we are here. Lots of yam, plantains, okra, stews, and porridges, and lovely fruit, so I’ll try not to complain too much! This entry was posted in baking, food, Ghana and tagged living in Accra, pizza, sweet potato on January 23, 2016 by krumkaker. This is my first time actually living in Africa, and things like organizing drinking water have been a learning experience. Wikipedia says ” The lack of clean drinking water and sanitation systems is a severe public health concern in Ghana, contributing to 70% of diseases in the country.” We have tap water, and are fortunate; it may not be safe to drink, but is fine for household issues. Relatives who lived in East Africa boiled and filtered water to get drinking water, but electricity is so expensive here (it just went up 57% in December!) that it is actually cheaper to buy water. At least that is what I was told. Two of the big bottled water companies are Voltic and Bel-Aqua. The latter I tried to order from first; centrally, very helpful. However, I called the the delivery person for our area, who kept promising to call back, and never did…… so after five days I gave up and called Voltic. Super efficient. We ordered ten drums, which we think will last us about a month, then we just call and get refilled drums delivered. 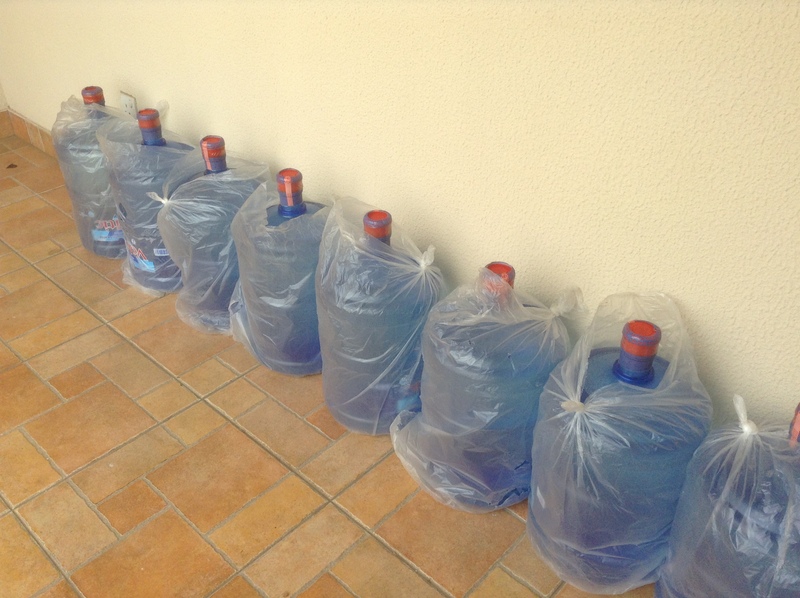 Per December 2015, it costs 51.5 cedis for each drum of 18.9 litres (about 13.4 USD) and next time, the refill will be 6.5 cedis per drum, delivered, so about 1.7 USD each. The plastic drums are reusable, fortunately. Normally you would have a water dispenser where the drum sits upside down, some even with cold and hot water, which looks very handy. We do not have a dispenser yet, and as the drums are 18.9 litres, it’s a bit bulky, but great to have lots of drinking water! It’s normally hot and humid here, but December-January it’s the harmattan, a dry dusty wind from the Sahara, so there is dust everywhere, and the city is hazy and even looks foggy from the dust. And yes, LOOK! It’s our Simonelli Italian espresso machine! Our small pile of boxes were delivered from Rome after weeks in customs, so after five weeks of Nescafe I am finally enjoying a decent cup of cappuccino in the morning, thanks to my lovely husband. In contrast to my quest for good coffee, many people here do not have access to basic sanitation or uncontaminated running water. We are fortunate that we can afford to get clean water delivered like this. 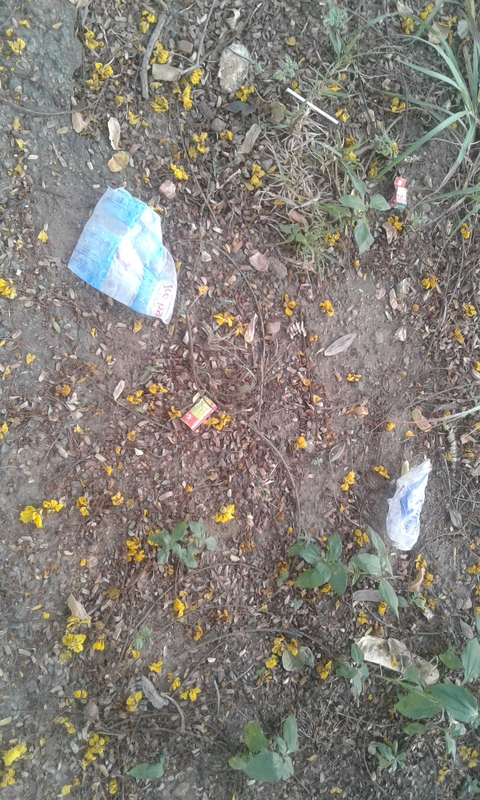 Those are discarded water sachets, which a lot of people reply on for drinking water. From a a really interesting article on this called The Cost of Pure Water, April 2015: “In Ghana alone, 3,000 children under five years old die each year from waterborne illnesses transmitted through contaminated drinking water and poor sanitation. One study estimated that for every year lived in one urban Ghanaian neighbourhood, pathogens passed on in drinking water were taking back half a year of healthy life. […] Ghanaians have to balance their time, money and safety to determine where they will get a drink. Millions of them choose to get their water in 500-ml plastic sachets.” See also this article from 2013: https://nextcity.org/informalcity/entry/tiny-bags-of-water-buoy-an-economy-and-make-a-big-mess and this new post from Practical Action: Nairobi’s informal water vendors: heroes or villains? Like Nairobi, while almost all residents have access to a mobile phone network, very few have access to clean drinking water also here in Accra. It is such a modern city in some ways, and lacking such basic infrastructure in other ways. Lots for me to to learn. 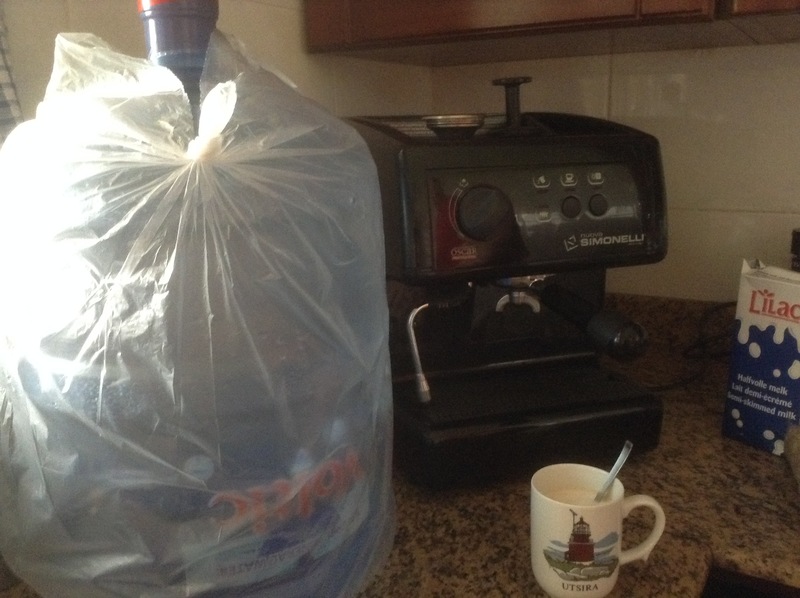 This entry was posted in Ghana, travel and tagged coffee, living in Accra, water on January 10, 2016 by krumkaker. Fresh tomatoes from Agbogbloshie Market: the supermarkets here seemed to have a lot of Dutch tomatoes, so I was so happy to go to the market and see a better selection of local tomatoes. Passata is expensive, and the pre-made pasta sauces seem to be oddly flavoured, so time to make some basic tomato sauce for pasta and pizza. Agbogbloshie is better known as the digital dumping ground in Accra, but there is also a older large fresh produce market there. After washing the tomatoes well, I chopped them up, slow-cooked them with onions, a bit of garlic, and salt and pepper. The tomatoes should have been soaked in disinfectant first, as the tap water is not clean here (cholera, typhoid…. ), but I figured a couple hours of slow cooking would help. Voila!I was thinking of Rachel Roddy’s tomato sauce and the plan was to make a smoother tomato sauce like passata, but when almost all of your kitchen tools are in transit, including the food mill, funnel and storage containers, one improvises. This became a slow-cooked, very tasty (though unblended) tomato sauce, ladled up with an espresso cup into little water bottles for freezing. All set for pizza or pasta. We are lucky to have a proper kitchen here, and this move to Ghana is certainly teaching us to be more selective about what we need. The selection of kitchen tools in shops is better than expected, though anything imported is expensive. While waiting for our small set of boxes from Rome, we bought pots, pans, plates, a chopping board, and three kitchen knives. It will be nice to have the food mill, a kettle, the Norwegian waffle iron from my mother (a little luxury! ), and I miss baking, but we are managing fine. Cooking again makes it feel more like home. This entry was posted in food, Ghana and tagged tomatoes on January 3, 2016 by krumkaker.